Everybody hold on to their butts! It’s a week of TCC that you may or may not ever forget! 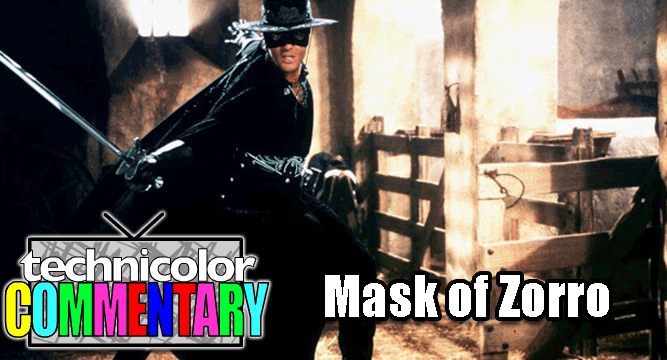 I bore the gang with my pick of the week: The Mask of Zorro, that fun flick from 1998 starring Antonio Banderas, Anthony Hopkins, and the ever beautiful Catherine Zeta-Jones. I remember when I first saw this. My family rented it from the local Take-2-Video and we settled down to watch what would become perhaps one of the more fun films I’ve seen. There’s action, intrigue, and romance with a capital arrr. Hrm. Rolling the r’s doesn’t quite work in text. As always, you can sync the episode up with the DVD. Just wait for our countdown and then press play when we do! Enjoy!